Have a great stay at monkey republic. Room was big and the bathroom clean. Great bar with a good variety of food for a cheap price. For the price of this hostel you really can’t go wrong! Can’t fault this place it was great. The staff were really friendly and helpful. The food was great - best bangers and mash I’ve ever had! So good I ordered it 3 times in 2 days. We got a free upgrade to the 6 bed dorm which was clean and spacious. 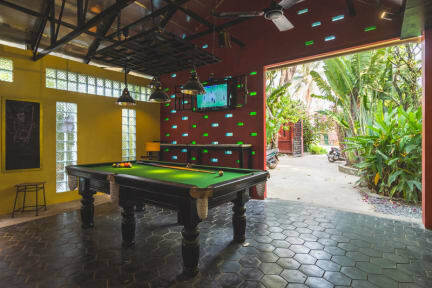 Would definitely recommend this place to anyone staying in Kampot! Great hostel, with beautiful grounds and a nice bar area. They can help with tours to the Bokor Mountain as well. Only stayed for one night. Cold A/C in rooms! 2 toilets/showers in dorm room which is very convenient. Staff are friendly. Yoga class was really nice. Recommend. Great place to stay. Staff is helpful, beds are comfortable, dorms have a lot of space, fun yoga class offered MWF, tasty food, and only a short walk to the pier. No hot water or free water bottle refills, other than that absolutely perfect! I had a great stay at monkey republic. The beds are good, there’s a curtain and private light - which is always nice. I stayed there during New Years, so they were a bit understaffed - but it was not a problem. Food there is great, there are vegetarian and vegan options. Good atmosphere - would stay again! The bathrooms weren’t that clean tho. Great hostel. Lovely welcoming and helpful staff. Amazing food!! Both Cambodian and western dishes if you fancy a taste of home. Would really recommend. This hostel was fine. I didn’t like that the head of my bed was 1 metre way from the toilet in the ensuite, so I could hear and smell everything! Good sized locker under bed. Bar had decent food. The toilet seats were never cleaned properly, so it looked like weeks worth of grossness on the edge of them.